This quotient and remainder calculator helps you divide any number by an integer and calculate the result in the form of integers. In this article, we will explain to you how to use this tool and what are its limitations. We will also provide you with an example that will better illustrate its purpose. a is the initial number you want to divide, called the dividend. n is the number you divide by; it is called the divisor. q is the result of division rounded down to the nearest integer; it is called the quotient. r is the remainder of this mathematical operation. When performing division with our calculator with remainders, it is important to remember that all of these values must be integers. Otherwise the result will be correct in the terms of formulas, but will not make mathematical sense. Make sure to check our modulo calculator for a practical application of the calculator with remainders. Begin with writing down your problem. For example, you want to divide 346 by 7. Decide on which of the numbers is the dividend, and which is the divisor. The dividend is the number that the operation is performed on - in this case, 346. The divisor is the number that actually "does the work" - in this case, 7. Perform the division - you can use any calculator you want. You will get a result that most probably is not an integer - in this example, 49.4285714. Round this number down. In our example, you will get 49. Multiply the number you obtained in the previous step by the divisor. In our case, 49 * 7 = 343. 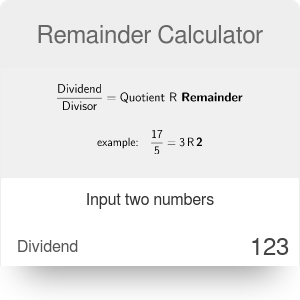 Subtract the number from the previous step from your dividend to get the remainder. 346 - 343 = 3. Remainder Calculator can be embedded on your website to enrich the content you wrote and make it easier for your visitors to understand your message.